Chocolate Milk is one of those flavors that a lot of e juice brands try to perfect. Some brands have it down to a science. Other brands are still working on getting that perfect blend down. 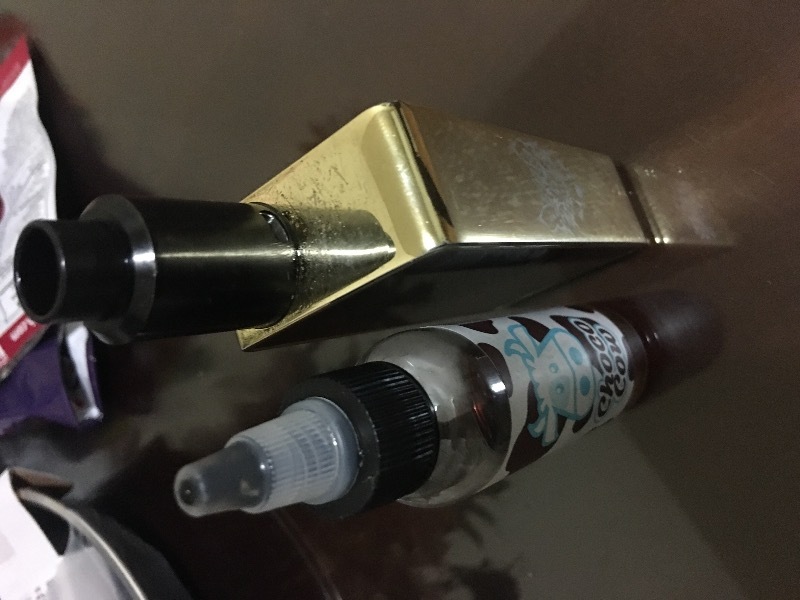 One thing we can say here at E Cigarette Empire is that Choco Cow has found the ultimate recipe and they have perfected the Chocolate Milk vape juice flavor. This e liquid has the flavor profile of a cold glass of creamy chocolate milk. It is has just the right amount of chocolate and the perfect amount of creamy milk. During your inhale the taste palate will be greeted with chocolate and pure happiness. The taste buds love nothing more than the sweet taste of chocolate. Upon exhaling is when the creamy milk coats the mouth with excellence and leaves an everlasting impression on the tip of the tongue. The throat hit is smoother than you can imagine. It is very refreshing and subtle with no burning or charring sensation. The e juice bottle design is just as appetizing as the flavor profile. It comes in a box that is white with a picture of a cartoon cow face. On the box is printed Choco Cow in brown and blue font. On the side of the box is printed Rich and Creamy Chocolate Milk. The e liquid bottle itself comes in a unicorn bottle with a built in screw top drip tip. On the vape juice bottle is a label with the same design as the box itself except the label is white with brown cow spots on it. The VG/PG of this e liquid is a 70/30 ratio which is proven to be the most popular due to the flavor and heavy cloud production. Here at the Empire we carry Chocolate Milk by Choco Cow in a 60ML bottle with nicotine levels of 0MG, 3MG and 6MG. Come stop by and take a sip of this famous chocolate milk. You will be hooked! It tastes like a chocolate. Does it it tare like chocolate milk? Not really but it's acceptable. It's nothing special. Overall a very satisfying, accurate chocolate milk flavor at higher wattage levels (sweet spot for me is 90-100 watts on an RDA). At the lower watts (50 and below) the chocolate milk flavor doesn't quite pull through in my opinion. Shipping and pricing through E-Cigarette Empire is second to none! I'm using a single 5 wrap ss juggernaut coil, at 70w. I've been on a chocolate kick, and this juice didn't disappoint. It's like the milk after you eat coco pebbles. It's awesome.